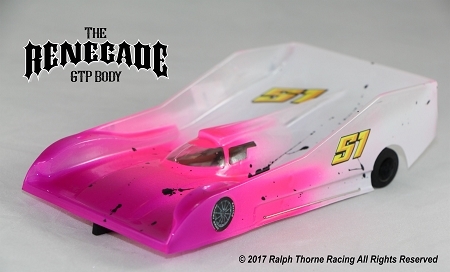 Home > Bodies > Renegade GTP Body .005"
Ralph Thorne Racing proudly presents 'The Renegade,' our newest and fastest 1/24 GTP body that we are manufacturing in-house. Appropriately named, The Renegade breaks all of the rules. It's lower, wider, longer and just flat out faster. You will find it is loosely based off of the 2017 Cadillac DPi-V.R prototype that you currently see competing in the IMSA racing series. It features a unique recessed body pin area and front wheel sticker location that makes the front wheels easy to align on both sides. This body truly blends a modern and realistic race car appearance with superior race winning on track performance. It creates big time downforce without adding rear drag, allowing you to decrease your laps times and turn more laps, plain and simple. We were absolutely blown away during testing and we know you will be too. Compared to our Warrior body, the Renegade is a little longer, wider and creates much more downforce. They are available in .005" and .007" thick Lexan. Each body comes with a window mask and a pair of front wheel stickers. Please note that we start from .005" and .007" material, so it will be thinner on the sides. As always we strive for quality pulls with even side thickness. The new body also features a cut line to assist in body trimming. If you purchase five or more bodies direct at full retail, an extra body will be included with your order as a thank-you!